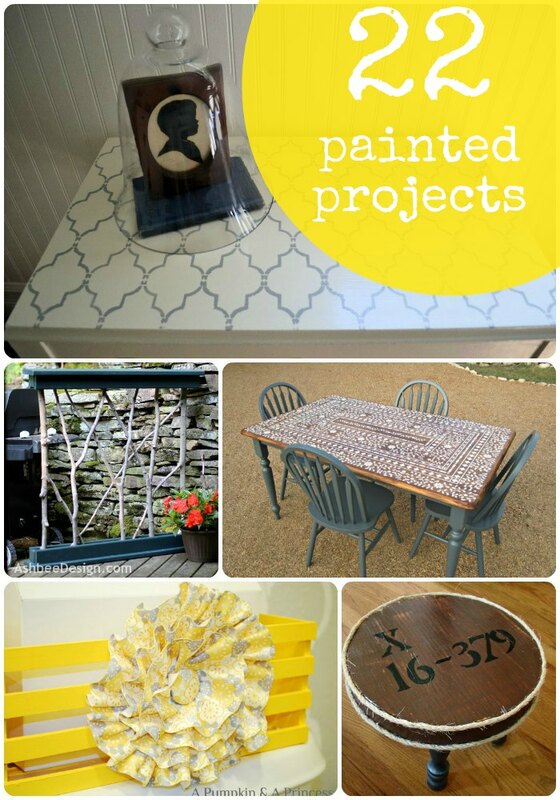 Paint Makes All The Difference -- 22 Painted Projects to Make! Great Ideas — 22 Painted Projects to Make!! Paint is an easy and quick way to add a completely different look to almost every project!! Here are 22 Pretty Painted Projects that were linked up this week. There are many more great ideas linked up, and so many amazing ideas in all kinds of areas from home decor, refashions, recipes and more. Be sure to check them all out for inspiration!! Don’t forget to check out the Weekend Wrap Up Party! And come link up YOUR great ideas — and show them off!! There are so many awesome projects linked up this week! And if you are looking for even MORE painted projects to make, here are 20 more!! Great Ideas — 25 DIY Creative Projects!! Great Ideas — 20 DIY Painted Projects for YOUR home! 21 Beautiful DIY Project Ideas!! Great Ideas — 17 Painted Projects! Great Ideas — 20 Fall Tablescape and Centerpiece Ideas!! Great Ideas — 20 Furniture Transformations!! Great Ideas — 20 Wall Art Projects to Make!! 10-Minute Spray Painted Shoe Makeover! Thanks for the shoutout Jen!! Love you! Thank you so very much for featuring my tie-dyed tennis shoes! I love your blog and so appreciate the support! I am always slow to the comment field but this morning I see you featured my grill screen. Thank you for pulling it out of all the great ideas that posted at your party. I do appreciate your features area each week with the large photos and am especially interested in Kammy’s painted rug- off to explore more. Have a great week. Thank you so much for featuring my Breakfast Nook Redo! Made my Sunday!!! Wow! Thank you so much for featuring my Ombre chair! So many cute, creative projects! Thanks for including mine! These are all so great! The coffee table bench might be my favorite, but Kammy’s whole porch is incredible. Love! Oh my goodness! I was scrolling through these other great projects looking for ideas and gasped when I saw my own tray! Thanks so much for featuring it, Jen!! yeap paint solves all ….wish we could use it to fix some of the what happens in our world…to make a better place for all…just finished another and some of what you posted are inspirations for the next one…thanks so much for your fun posts…and you are on my side bar…. Jen! Thank you so much for the feature! I’m so glad you liked my Mercury Glass Lamps! I’m a HUGE fan of your blog!